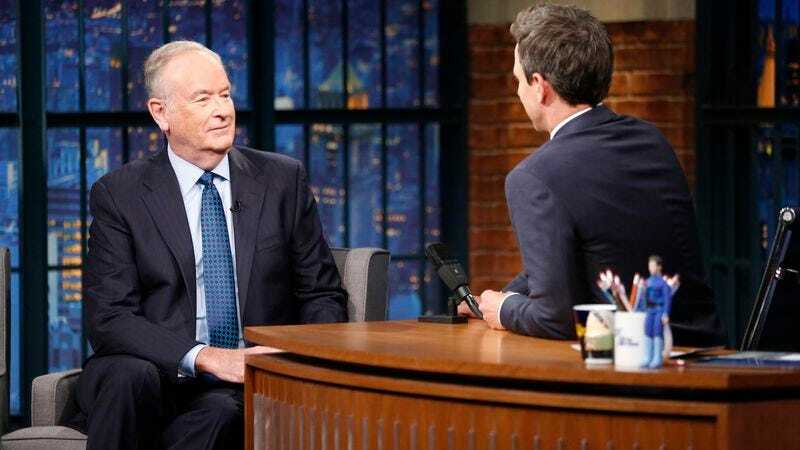 Because nothing draws eyes to a sexist, bloviating volcano like the rumblings of an imminent eruption, The Hollywood Reporter reports that ratings for Fox News’ The O’Reilly Factor have steadily increased since Saturday. That’s when the New York Times published an article drawing attention to host Bill O’Reilly’s history of sexual harassment settlements, setting off an advertising exodus that has now seen more than 40 companies flee the show’s valuable ad spots. Increasingly valuable ad spots, in fact, as Tuesday night’s broadcast scored ratings 20 percent higher than the same night the week before, drawing in 3.76 million viewers, the highest number in cable news. It’s not clear how much of the ratings boost is due to genuine support for O’Reilly, Fox News’ most successful public face, and how much of it is people waiting for the explosions when the host finally fires back at the elephant in the room. So far, he hasn’t (although Fox News put out a statement about the ad boycott, which started with Mercedes-Benz and has spread to prime advertisers like Lexus, H&R Block, Advil, and dozens more, last night.). Given O’Reilly’s temperament and love of confrontation, though—and despite today’s vote of presidential support—it seems like only a matter of time before he goes after his critics, a spectacle sure to draw even more eyes to his show, although it remains to be seen who’ll be left to sell them products in between O’Reilly’s screams.